“Human behavior doesn’t just come out of nowhere but is the result of a thoughtful process” (1), says Timothy Witmer, Professor of Practical Theology at Westminster Theological Seminary. It is based on this premise that Witmer aims to help readers engage the landscape of their minds (mindscape) by intentionally cultivating biblical thought patterns in lieu of worry. This emphasis on transformation by the renewal of the mind is a very Biblical approach to worry, yet the book as a whole falls a bit flat. 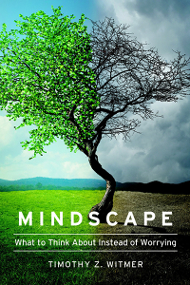 The lack of practical helps in cultivating new thoughts is noticeably absent in Mindscape. The goal of meditating on each “vista,” as he calls it, is to impact not just the way we think, but the way we live. In so doing we will cultivate new thought patterns and behaviors that will replace and push out the worry (12). The book succeeds in explaining each of the elements of Philippians 4:8, but lacks in helping readers apply them consistently. Each chapter focuses on one element of Philippians 4:8, unpacking its details. Chapters 1 and 2 set up those portions of the book both by introducing the subject of worry, and then directing readers to the power of prayer. Prayer is at the very heart of Paul’s treatment of worry. In verses 6-7 he tells us not to be anxious about anything, but instead to make our “requests…known to God” by means of “prayer and supplication with thanksgiving.” “Prayer is the reset button we need to engage when things go wrong in life,” says Witmer (17). We turn to God and that both puts things in perspective and brings peace. It’s good counsel, but apart from some other encouragements and helps it can seem a bit trite. That’s how much of the book feels: true but insufficient. Witmer offers real legitimate counsel, but it never seems to reach the activity of actual life. The book seems to misunderstand how disciples are made. It is not merely an issue of the mind, as important as that is. It involves activity, habituation, and life-immersion. The worrier certainly does need to change the way that they think, but that doesn’t just happen by saying, “think about this instead of that.” Worry can’t just be switched off, we need practical helps to transition our thinking, and that’s where the book falls short. The many people whom I have counseled for anxiety know that they need to stop worrying, know that they need to think differently, to trust God more, to recall His promises, etc. Their trouble is knowing exactly how to do it. They, like all of us, struggle in living out of the promises of God. That doesn’t change simply by saying, “think about this.” Even Paul does more than just tell us think differently. He tells us to “practice” these things (Phil. 4:9). It is in this area that most people need real help. Mindscape has much to commend to us. The thorough exegesis and explanation of Philippians 4:8 lends itself well to aiding people in understanding the new thought patterns they need to develop. As a resource in counseling it could do much to help people understand what their thought patterns should look like and towards what they should be directed. Yet, in terms of helping them actually make progress and move, I am afraid other resources will need to be consulted. At one level, the book does exactly what it says it will do: it tell us what to think about instead of worrying. It doesn’t, however, tell us exactly how to do that.